Our certified wedding specialist, Jessica Veldhuis, will be there to assist you every step of the way. For more details, contact Jessica at 1-800-465-9077 ext 253 or jveldhuis@livingwaterresorts.com. All your dreams of the perfect wedding will come true at Living Water Resorts — and not just the ceremony, but the entire experience. 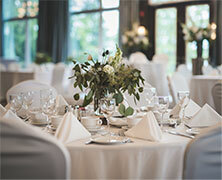 We offer a variety of customizable options, all in-house services, affordable accommodations and several beautiful venues.